Founded in 1957 as the first dry-process cement plant in the UK, due to a limited supply of water on the site, Cauldon cement plant this year celebrates its 60th anniversary. 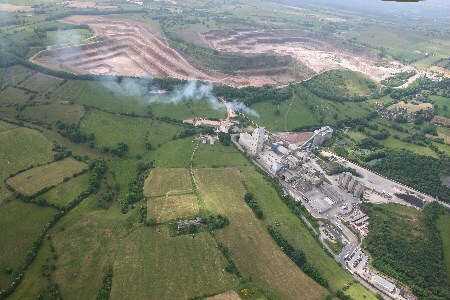 Cauldon cement employs 150 people and produces roughly 960 000 tpy of cement; nearly 10% of Britain’s cement production. This equates to 2 million bags a month Nestled in the heart of the Staffordshire countryside, it sits in close proximity to the villages of Cauldon and Waterhouse, which have grown and thrived due to the employment opportunities provided by the plant. Although its ownership by LafargeHolcim makes it part of a global company, with all the commercial, training and travel opportunities that come with it, at its centre Cauldon cement still feels like a local business, with employees who have been there for over 40 years, and strong ties to the community. The local school is an excellent reflection of this: it also celebrates its 60th anniversary alongside that of the plant, having been built to accommodate the children of those who worked on site all those years ago. Cauldon cement is, as ex-plant manager Martin Bains put it, ‘multilocal’. With the plant’s anniversary celebrations in full swing, World Cement visited the site to both take a look at how far it has come over the last sixty years, and investigate where it plans to go in the future. "Celebrating sixty years of Cauldon Cement"
Limestone activity on the site goes back several centuries, being first recorded in the 1700s, but permission for the plant itself was first granted in the 1950s. Unfavourable ground conditions, bad weather, and post-war steel shortages caused delays, meaning that work did not begin on the site until 13 July 1954. Construction took two years and ten months to complete, and cost around £3.5 million. The kiln, a German Lepol design that would soon be followed by kilns two and three, was first lit on 25 April the same year, with the official opening ceremony taking place shortly afterwards, on 27 September 1957. Originally sold under GT Earle’s Pelican brand, which was discontinued in 1966, Cauldon’s cement was then marketed under the name Blue Circle. In 1978, the Associated Portland Cement Manufacturers Ltd (APCM) and the British Portland Cement Manufacturers Ltd.(BPCM) merged to form Blue Circle Ltd.
One of the most significant changes came between 1982 and 1985, when the plant underwent substantial reconstruction. This included a new precalciner tower, warehouses, control building and silos. At the same time, the first Lepol kiln was replaced with a more technologically-advanced 850 000 tpy, suspension preheater, precalciner kiln. Kilns two and three, also of Lepol design, were then removed in 1986, leaving the plant with the single kiln that it has today. Further changes awaited the plant, with it being acquired by Lafarge in 2001, before merging with Tarmac in 2013. The most recent development, the merger between Lafarge and Holcim, which took place in 2015, has led to significant changes in the running of the site. The site was retained by LafargeHolcim and is now managed by the company’s UK subsidiary, Aggregate Industries. In 2015, Lafarge and Holcim merged, and Lafarge Tarmac transferred its assets in the to Aggregate Industries. This included the plants at Cauldon, Staffordshire and Cookstown, as well as the quarry at Cauldon Low, and the cement terminal at Belfast Docks. This was the first time that Aggregate Industries’ portfolio included cement, enabling it to focus more internationally, emphasising its innovation capability and allowing it to offer a complete package that focused on customer-oriented solutions, rather than simply on products as it had done previously. As would be expected, the merger has been huge and complicated, both culturally and physically, but the open and human-oriented outlook of both companies smoothed the way, and it was quickly discovered that there was a lot of common culture between the two: indeed, most employees quickly began to claim that they were members of ‘LafargeHolcim’, with no need for rivalries or distinction between who had originated where. Cauldon itself has always been known for its high-quality cement, due to the excellent limestone reserves that it draws from, but the name had been associated with Tarmac for a number of years. This meant that, when Tarmac took its brand names, LafargeHolcim had to work hard to rebuild its brand. The strong identity of the Lafarge brand in other areas, alongside the fact that Aggregate Industries did not have a brand of its own, led to the decision to market the cement produced at Cauldon under the Lafarge name, once any pre-existing deals from Tarmac had been completed. The team has had a difficult task in rebuilding its customer base and reputation, but has done an excellent job, leveraging pre-existing relationships through Aggregate Industries to offer a complete package directly to builder’s merchants. The last twelve months have seen Lafarge put significant investment into a portfolio of new products, and this, alongside the work done to rebuild the brand itself, meant that, following its launch, the new Lafarge-branded cement is being enthusiastically taken up. The merger has also led the company to increase its focus on research and innovation. It has commissioned a lot of work into where the construction industry is going in the future – looking into social housing solutions in particular. Its reputation and its product is only set to get stronger. The past two years have seen Cauldon cement battle with the challenges caused by internal company changes, and it has certainly come out on top. Yet alongside this, is has also had to contend with the difficulties facing every cement plant: the mounting pressure to make cement manufacturing more environmentally friendly. Perhaps the most obvious way that LafargeHolcim has addressed this pressure is through an increase in the use of alternative fuels (AFs). With emissions limits increasing, and ever mounting pressure to make the cement industry greener, the Cauldon cement plant is leading the way in AF management and uses around 1 million tpy of AF. The plant derives 60% of its energy from waste-derived fuels, including processed sewage pellets, liquid derived fuels, and recovered solids. It is also the biggest user of tyre-derived fuel (TDF) among the LafargeHolcim plants in the UK, consuming 140 cars' worth of tyres an hour. This, combined with more traditional emissions regulations, including the introduction of a baghouse for the clinker cooler, enabled the plant to reach eight consecutive years of compliance with emissions limits from the main stack in 2017. Following this success at Cauldon, the company also introduced AFs at its Cookstown site, successfully increasing its use from nothing, to nearly 40%. LafargeHolcim also plans to launch Geocycle, its waste-management company, in the UK later in 2017. Another key environmental focus for the site is the restoration of its quarries. Its most used raw material is limestone, with 1.2 million tpy dug from a quarry south of the plant. This is closely followed by shale, which is quarried from land to the north and west of the plant, with 200 – 220 000 tpy dug out. In the past the site has also operated a number of other shale quarries, which were shallow, small, and quickly completed. This meant that quarry restoration is high on Cauldon’s list of priorities. In 2008, the limestone quarry reached its maximum permitted extent to the south. This led to the unusual situation in which restoration began at one end of the quarry, while the other end was still being exploited. Experiments are now underway to create the best conditions for wildlife diversity at the site, while a series of trials on how to create biodiverse limestone grassland are in progress, and are already yielding excellent results. This is supported by a voluntary process to collect species from the quarry and distribute them to other sites. In addition to this research, rollover slopes have been used to ensure that the site looks more natural for future generations. By working hard, and collaborating closely with groups, including Natural England, the team at Cauldon cement is able to ensure that the area will be preserved for years to come. With the exciting opportunities opened up by the LafargeHolcim merger, the future is open for Cauldon cement plant. Including Cauldon, Aggregate Industries has over 300 sites across the UK, with the majority of product being moved by rail and water. This makes logistics a key avenue for exploration and development in the coming years. Similarly, despite uncertainty following the Brexit vote, the next few years are certain to continue to bring changes for the UK. Despite this, however, Cauldon is certain that it will be able to weather whatever storm is thrown at it, citing the UK’s resilience, and the importance of construction to the economy as key factor’s driving a continued demand for cement. With housebuilding high on the government’s agenda, and a number of significant projects, such as High Speed 2 and the London Tideway, supporting LafargeHolcim’s business, the next 60 years look to be as bright as the last.